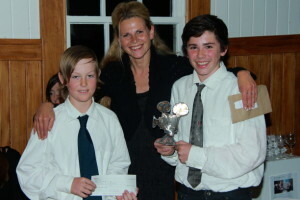 The 2013 RAFFA (Raglan Arts Film Festival Award) awards ceremony was held on 21 September at the Raglan Old School Arts Centre. 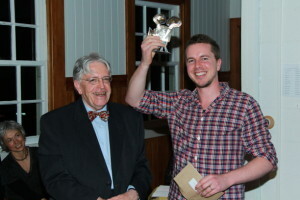 Festival director Rodger Gallagher (left) presents the RAFFA Feature Film Award to James Brown for his documentary Red, White Black and Blue. 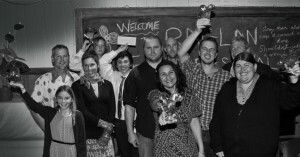 For the first time, the award recipients received a cash prize with their awards. This was made possible by generous support from Droidworx, PiwiWiwi Campers, and Stendy Electrical. Dave Duffin and Kurt Oram for Roy Stuart – Surfer for sharing the uniqueness and design that is Roy’s surfboards. Mike O’Neill and Lyn Kriegler for Khushi, which bought to the Raglan community an awareness of the Shanti Niwas Charitable Trust and the support centre that exists to help those in need. Juan Duazo for Silent Might which documents a significant and important assembly of members of the Raglan Community and KASM voicing their strong opposition to seabed mining. 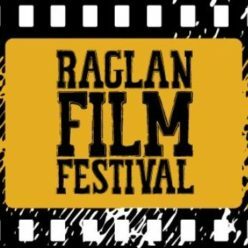 Micah Puklowski for Restless as director and producer for yet another great entry into the Raglan Film Festival. The RAFFA awards were designed by Phil & Emily Meek from Surreal Steel. The award design captures the old-school style of a film movie reel. Unable to sleep, older sister of two Victoria must return to a family favourite vacation spot to face her past and try to find closure. This acclaimed documentary follows a group of high school students from South Los Angeles as they embark on a rugby tour of New Zealand. The group’s tour includes a visit to Raglan, where they play a game against Melville High School. 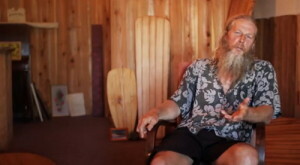 A profile of Roy Stuart, a surfboard creator who has a very different approach to the craft. His boards are extremely long and are designed for speed and ease in surfing. His boards are both functional and pieces of art. He lives with his large family in Putaruru and often makes the trip to Raglan in his old bus to catch a few waves in his highlighter orange wetsuit. Raglan-based director Ben Lenzer tells the story of Toronto artist Leslie Slowley who can be seen riding his bike around the streets of his city, sitting on the handlebars, facing backwards. Slowley shares his unique philosophy of backwards riding. 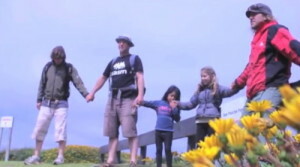 Phil McCabe, Bernadette Gavin and their 11-year-old daughter Sequoia walk the coast between Opunake and Whanganui over the course of a week, engaging with South Taranaki communities on the issue of seabed mining. 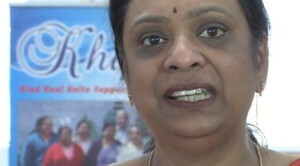 A look at the little known problem of elder abuse amongst Indian and South Asian people in New Zealand – and the charitable organisation that helps them. 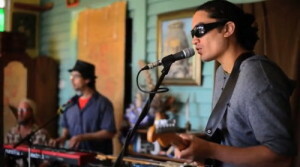 The music video for the second single off Cornerstone Roots’ album Rock My Soul. 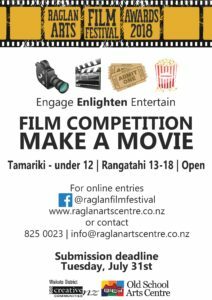 Filmed in Raglan. Raglan groms at the skate bowl.